Food is no longer an enemy, nor a friend. It's nothing to me but a part of the daily routine, like teeth-brushing. I have lost 40 lbs, folks. Pretty dang amazing. There is something I did not foresee, something happening to me right now. It is this: Without my former life-long vice, unpleasantries abound. The proverbial hole in my soul is staring right at me. Who knew I'd get to see it like this? Or ever? I have no want to drown it in booze or fill it with pizza (admittedly, pizza sounds fantastic right now, but no). There has got to be something else to do with this thing, this hole. Right? Yes, I have wonderful children. Yes, I have really neat friends. Yes, I am capable of doing and creating a surplus of questionably useful things that are semi-interesting. But I suddenly feel I'm wasting my capabilities and that I should be doing something to turn them into talents. This entry is all over the place but you know why, right? I'm just now putting my thoughts into these little words for the first time ever. I am a new me. Thank goodness I'm young enough to follow up the figuring with actions. Go figger. 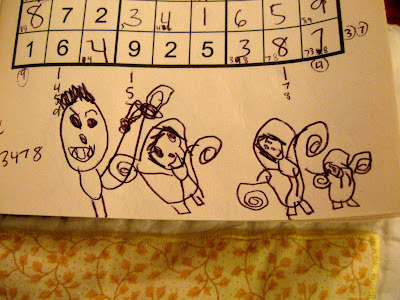 Here is one of many illustrations by Raquel in my sudoku book. She draws pictures in this book everyday. This one happens to be me getting my hair done by my hair-doer, Sara, and Raquel and Maxine are sitting in chairs off to the side, waiting for me to get done. I don't know why Sara has crazy-big teeth. Don't you love it? what happened about going to school? i don't know any advice for the void in your life...i guess when your husband is gone for a while, your brain can only think "___ many more days" and have that to look forward to or distract you. i hope you do turn your hobbies/talents into a profit somehow! and the chaird at your salon must be pretty cool looking! lol. um, HELLO, write a children's book illustrated by racquel!! i'd like to pre-order 5 copies, please. Sam, I am still excited about going to school. I just think I'm gonna have to compromise since Jose doesn't wanna move and the local school here doesn't have the classes I need/want. I'll just be going to school to go to school but at least that is something. I have 2 reread this posting again later. In the meantime, pizza sounds very good right now to fill the noisy hole in my stomach. That is awesome Sarah!!! You look great in your pictures in your earlier post. Very motivating. Wow, I love what you wrote, very deep stuff. I feel like I can relate.